Wayne Hardin, a former Temple and Navy football coach, pledged to do what he could to fill the stands at the Linc when the teams meet in their season opener. Former Temple football coach Wayne Hardin was back on campus yesterday. He was following through on a vision he had on Oct. 28 while watching the host Owls snap a 20-game losing streak with a 28-14 victory over Bowling Green. "I looked around in the stands and there weren't too many people there," said Hardin, 81, who retired in 1983 after guiding Temple to an 80-52-3 record over 12 seasons. "I thought, What comes first, the chicken or the egg?" he recalled. "I've been a long believer in home-field advantage, if you have enough people there." Hardin, still spry, stood in the weight room at Edberg-Olson Hall as the Owls scrimmaged outside. Temple students and fans mingled on one sideline, enjoying a barbecue as music blared. Hardin was there to promote the Owls' Aug. 31 season opener against Navy, where Hardin was 38-22-2 as coach from 1959 to 1964. He has vowed to sell out Lincoln Financial Field. "I said I'd do my best to do what I can to put 66,000 people in there for the first game," Hardin said. "I went out on a limb, and everybody said I kind of lost it. I don't know if I ever had it. My experience here was so great, I just felt if there was something I could do to help out, I'd do it." Hardin, who guided Temple to its only bowl-game triumph in 1979, may be just the man for the job. 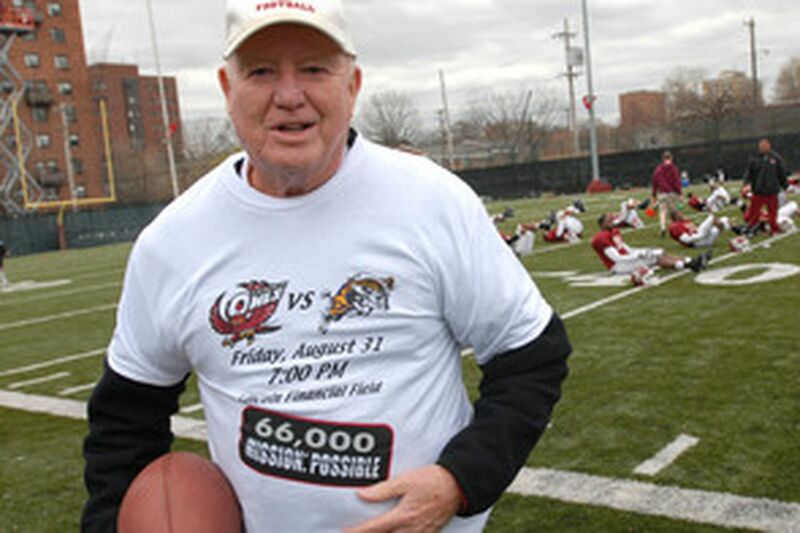 Temple's all-time leader in career football wins, Hardin is one of eight coaches on the 2007 candidates' list for the College Football Hall of Fame. At the Navy game, a Temple student will win free tuition for a semester and two fans will win leases on new cars. Navy, which is likely to have roughly 30,000 backers on hand, will march in its midshipmen before the game. "I called Bill Bradshaw and said I'd put 66,000 in the seats for the first game," Hardin said with a smile while referring to Temple's athletic director. "I asked, 'Who is [the opponent]?' He said, 'I don't know.' When he came back and said Navy, that just cut my job in half. "At Navy, all students must attend all home games. I would like to see Temple adapt that theory." The game has been moved from 7 p.m. to 7:30 p.m. to accommodate ESPNU. Tickets on sale. Single-game tickets for Owls home games will go on sale this morning through Ticketmaster, at the Lincoln Financial Field ticket office, or online at www.owlstix.com. Tickets for the Nov. 10 Penn State game can be purchased starting today only as part of a full or partial season-ticket plan. For information, call 215-204-8499 or visit www.owlstix.com.